The Utica Shale is a fairly new shale play but it is already proving to be a rich source of hydrocarbons. Similar to the prolific Eagle Ford Shale in Texas, the Utica has three defined hydrocarbon windows – oil, wet gas and dry gas – as you move from west to east in the play. Named after the city of Utica, New York, where it outcrops at the earth’s surface, the Utica Shale is estimated to span 170,000 square miles, which would make it nearly twice the size of its neighbor, the Marcellus Shale, according to the Institute for Energy Research. The Utica Shale extends from Kentucky into West Virginia, Ohio, Pennsylvania, New York, and even stretches as far north as Quebec, Canada. Researchers estimate the depth of the Utica Shale to range from 14,000 feet to less than 2,000 feet below sea level. The large portion of the Utica Shale located beneath the Marcellus Shale can be up to 7,000 feet below the Marcellus shale in Central Pennsylvania and less than 3,000 feet below the Marcellus Shale in Eastern Ohio. The Utica Shale varies in thickness from less than 100 feet in some areas to over 500 feet thick in others. Researchers are still working to determine exactly how much natural gas the Utica Shale will produce. If natural gas production is established over the full extent of the formation, it would make the Utica Shale the largest natural-gas field known to man. The Utica is an organic-rich calcareous shale deposited during the late Ordovician period around 450 million years ago. 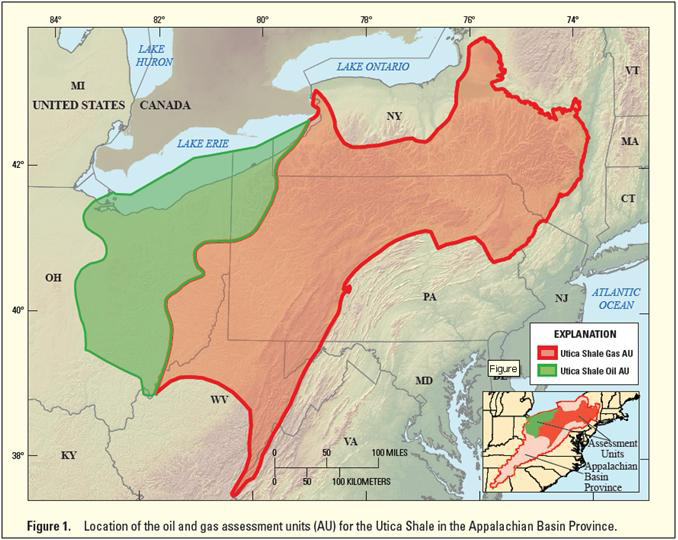 Similar to the Marcellus Shale, the Utica Shale is a black shale but it has a lower clay mineral content and a much higher carbonate content and therefore, does not respond as well to the hydraulic fracturing methods used in the Marcellus. However, as is being done successfully in the Eagle Ford Shale, “frac” companies are adjusting their hydraulic fracturing methods in the Utica to account for its increased brittleness. Currently, Eastern Ohio, the wet gas window of the play, is the most active drilling area as well as the most profitable in the Utica Shale. The Ohio Geological Survey estimates the Utica Shale may have up to 8.2 billion barrels of oil and a recoverable potential of 3.8 to 15.7 trillion cubic feet of natural gas. In Ohio alone, approximately 502 wells have been drilled and 125 wells are in production according to a report in the Akron Beacon Journal online that ran Aug. 16, 2013. Although the depth of the Utica Shale makes it more expensive to drill than the Marcellus, the infrastructure already in place in areas where the Marcellus has been tapped will prove to be an advantage as the Utica Shale play develops. In spite of higher drilling costs, the Utica Shale play-especially in Eastern Ohio-has already become a popular and profitable target for many oil and gas companies.